What Handbook Changes Should You Make as a Result of the Recent NLRB Memo? After reviewing these specific policies, the NLRB determined that unless these policies were being applied in a manner intended to interfere with an employee’s right to engage in protected, concerted activities, then they were legal for employers to apply to their work environment. So, what does this mean for funeral service businesses? Death-care professionals need to look at their existing employee handbooks and/or HR policies to determine if they should be revised to address the change in the NLRB’s position on these policies. Let’s take a look at the nine policies in question to evaluate whether there is a possible impact on the business. What do you mean rough- housing is not allowed? Yes, that is right, funeral service employers are allowed to once again prohibit inappropriate behavior in the workplace such as “yelling, profanity, hostile or angry tones, fighting, rough- housing, horseplay, throwing things, slamming doors, waving arms or fists, verbal abuse, destruction of property, threats, or outright violence.” If you don’t have an “Employee Code of Conduct” policy that prohibits behaviors such as these, create one! These types of behaviors can create not only an uncomfortable, unmotivated workforce but perhaps even a hostile work environment for some employees. Be aware that you cannot ban employees from walking out or striking. Insubordination is allowed? Not so much So, previous to this new memo, the NLRB indicated it was unlawful to prevent insubordination or noncooperation of employees even if it was adversely impacting the business as they felt such restrictions could prohibit the employees from participating in concerted activities. However, this memo now clarifies that employers do have the right to address employees who are being insubordinate or uncooperative if it is posing a negative impact on the business – as long as it is not part of concerted activities. Funeral service employers should include in their code of conduct policy that insubordination and noncooperation that disrupts the business can lead to disciplinary action, including termination if such actions are not part of protected concerted activities. Civility? This is a term that should really be in all employee handbooks but was frequently overlooked, and then during the Obama administration, the NLRB concluded that HR policies should not refer to employees being civil within the workplace or utilize civility training despite the fact that the Equal Employment Opportunity Commission recommended employers do so as part of harassment prevention. Now the NLRB has concluded that civility does not restrain an employee from concerted activities. Funeral services employers should consider reviewing their anti-harassment policy to include civility training as well as the expectation that employees will treat each other with civility. This level of basic respect can help prevent harassment. Photos in the prep room? Today everyone has a In fact, most funeral service businesses rely on employees’ cell phones to reach them throughout the day and to keep them informed of family needs or to respond to calls. Through advancing technology, most cellphones are now capable of taking photos and videos. Previously, the NLRB did not allow employers to restrict an employee’s use of their personal cellphone (as there were occasions when employees legitimately wanted to photograph or record working conditions or labor protests). However, now the NLRB has indicated that the employer does have the right to ban unauthorized photography or recording. Funeral service businesses should have specific policies that prohibit employees from photographing or videoing the deceased at any time as well as funeral services or viewings (unless authorized in writing by appropriate individuals to do so). Additionally, consideration should be given to a social media policy that prohibits employees from posting photos or video related to the funeral business on their social media pages unless authorized by the business to do so. Yes, confidentiality does matter! Yes, funeral service employers, it is again legal for you to prohibit employees from disclosing confidential and proprietary information. Let me state that again: Funeral service businesses do have the right to protect the confidentiality of the families they serve, their employees as well as proprietary business information (e.g. preneed contracts, ) Funeral employers should include in their employee handbook a confidentiality policy that makes it clear that employees are prohibited from disclosing confidential information about the families they serve or any proprietary business information. Additionally, they do not have the right to disclose information about other employees they obtained from unauthorized access or the use of confidential records. Nor can they remove confidential records from your premises. Misrepresentations are a no- no! I just have to say, “Duh!” This should be obvious, but it is nice that the general counsel for the NLRB confirmed that employers have the right to prohibit employees from making defamatory statements or misrepresentations. Funeral service employers will want to address this issue in a couple of HR policies. First, misrepresentations on applications can not only mean that a job candidate will not be offered a position, but if an individual is hired and it is later learned they misrepresented facts on their application, they can be terminated. This can be addressed under the code of conduct policy. Second, under the anti- harassment policy, include a section that making defamatory statements or misrepresentations about other employees can lead to disciplinary action up to and including termination. Additionally, making such statements on personal social media accounts can be considered harassment and lead to disciplinary action. This can be covered under the social media policy. 7. Company logos don’t belong to the The NLRB acknowledges that “employers have a significant interest in protecting their intellectual property, including logos, trademarks and service marks. Such property can be worth millions of dollars and be central to a company’s business model. Failure to police the use of such property can result in its loss, which can be a crippling blow to a company.” Funeral service employers can therefore ban employees from unauthorized use of the company logo or other intellectual property that is owned by the business. For example, employees should not be using the funeral business logo on their social media accounts. The employee handbook can address this issue under both the social media policy and the employee code of conduct. 8. Who speaks on behalf of the funeral business? The NLRB memo also indicates that employers can require that employees have authorization to speak for the employer. Or in other words, funeral service employers can have a specific policy that makes it clear that employees are not authorized to speak on behalf of the business unless specifically granted authorization. This is another element that can be covered in the social media policy. 9. What do you mean you’re working for our competitor? Even before the issuance of this memo, the board did recognize that employers had a right to be concerned about conflicts of interest by their employees and to find ways to address those concerns. This current board makes it clear that employers can protect themselves. Funeral service businesses should include in their confidentiality policies clear language that either bans (or requires disclosure of) conflicts of interest (disloyalty), or employees who have had in the past or continue to have financial interest in competitors of their current employer (self-enrichment). Failure to disclose this information can be a violation of the code of conduct.When looking at the whole of these nine policy changes, it is evident that they can be very impactful to funeral service employers. Not only in terms of employee interactions with each other, management and the families they serve but on the successful long-term profitability of the business. No funeral service owner/manager wants to deal with a harassment issue nor do they want to lose their valuable preneed contracts to a competitor. Can you imagine your funeral home logo used on an employee’s social media account when they are posting objectionable content? 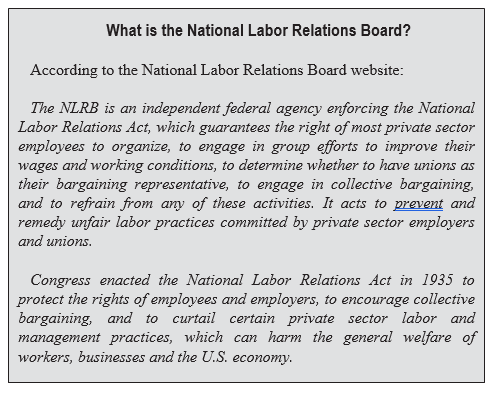 At first blush, this NLRB memo may not appear to be of any significant interest. But the reality is that the NLRB change in position on these key issues allows funeral service employers to protect their businesses more effectively in several key areas.